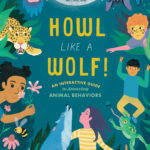 Last week I was happy to learn that Howl Like a Wolf! was awarded a Gold Nautilus Book Award. Their motto is “Books for a Better World” and I’m honored to have my book put in a category that includes titles by His Holiness the Dalai Lama, Amy Goodman, Desmund Tutu, Barbara Kingsolver, Thich Nhat Hanh, Naomi Wolf, Jeremy Rifkin, and Eckhart Tolle, among others.